Home » Nutrition Articles » What Is Your Gut Microbiome Trying To Tell You? What Is Your Gut Microbiome Trying To Tell You? The importance of gut health has been launched into the mainstream limelight, which is promising for the future of medicine. The gut microbiome is so intricately embedded throughout human health, it’s going to take nationwide recognition of these microbes to make a powerful and effective change in healthcare as we know it. The gut microbiome isn’t just the backbone of our health – it is our health. Preliminary discoveries surrounding the gut microbiome were incredibly exciting. The idea that the 100 trillion microbes living in our gastrointestinal tracts are facilitating hundreds of bodily functions is enough to get anyone’s attention. But even the most interesting facts being shared about the gut microbiome are barely scratching the surface. Approximately 70% of our immune system cells live in our gut wall – the microbes here train and control our immune system response. Our dynamic gut microbiome is as unique as a fingerprint. – The fact that our gut microbiome is both dynamic and unique, are key understandings missing from nearly all gut microbiome advice out there today. Most advice available offers blanket suggestions, which can give people perplexing results. The specific and active microbes of your gastrointestinal tract determine what you need to be healthy. This is different for everyone. Are these bold statements? Not at all. They are only the beginning. Modern healthcare has changed the face of disease. While we’ve found solutions for many of our infections, we did so at the expense of intricate systems within the body. Medications like antibiotics not only wreaked havoc on our microbiomes, they also created devastating superbugs in the process. Chronic conditions now account for 60% of deaths worldwide. More than 50% of people in the world live with a chronic disease. Over 149 million Americans have at least one chronic condition – that’s 47.7% of the population. The foundation of what it means to treat disease is shifting underneath us – and the solutions we require lie in the gut microbiome. WHAT DOES GUT MICROBIOME SCIENCE MEAN FOR YOU? We now have access to more information than ever before. Our great-grandparents might have guessed that having so much accessible information would make us healthier and happier, probably beyond their wildest dreams. Instead, we’ve created mountains of conflicting information to sift through, which has caused an underlying sense of confusion, frustration, and even paranoia. How is it that we’ve overcomplicated the simple task of putting food in our mouths? Should you follow the Paleo diet or Ketogenic diet? What about the Mediterranean diet? Many people are finding that these diets don’t always work out as planned – they don’t get the results they want and sometimes even experience strange side effects. You’ve probably experienced this yourself to some degree. Arguably, many of the more popular diets are doing us a world of good. We are moving towards a collective consciousness of personal responsibility when it comes to health, and that’s great all around. But it’s time to take our pioneering health intentions one step further. You can now use the science of gut microbiome testing to fully understand how you process (or don’t process!) specific nutrients. This can tell you exactly what type of diet you should be eating for your best health. THIS IS THE POWER OF PRECISION WELLNESS. 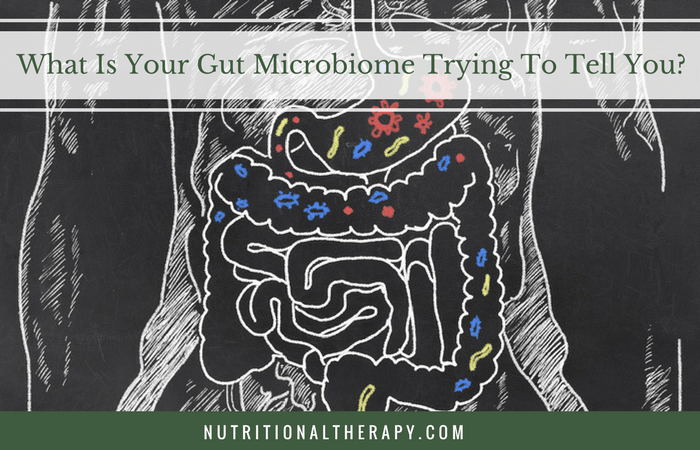 A specific example we often see is if you eat too much protein for your microbiome to handle, the bacteria in your colon begins to ferment it. This fermentation of excess meat creates harmful products, such as ammonia, cresol, putrescine, and trimethylamine (TMA), which have been associated with heart disease and accelerated aging. Not great news, is it? So, how can you tell if these supposedly healthy foods are harming you? Through RNA sequencing of course! RNA sequencing is a fancy way of saying we can see everything in the gut microbiome – down to the enzymes your microbes are producing. First, we had culture testing, which didn’t do so well because only the microbes that could live in the presence of oxygen survived. About 80% of your microbes are anaerobes – so, this gave us an incomplete picture. Next came 16S rRNA gene sequencing, which can be used to find the genus of the bacteria present. This testing can’t see viruses or eukaryotes and it can’t see species or strains. This only gives you a silhouette of what’s actually there. Unfortunately, this is still a common form of testing used by many companies. Then there was metagenomic sequencing or whole shotgun sequencing. This finally gets down to strain level but still struggles to see viruses or eukaryotes because they exist in low levels. This is a little better because it tells us who’s in there and what are they capable of doing. Finally, we have RNA sequencing. RNA sequencing can not only see everything (bacteria, archaea, yeast, mold, fungus, bacteriophages, parasites, and more), it can also see what’s active. This is crucial. Until RNA sequencing, we could tell what was there but we weren’t sure what was active or what they were doing – now we can. We are fortunate to live in a time when RNA sequencing of the gut microbiome is not only a reality – it’s accessible. Through RNA sequencing we are able to cut through the mountains of advice and give you recommendations that actually help support a healthy gut microbiome – advice that often contradicts most “healthy gut” lists out there. Everything we know about the gut microbiome suggests something you probably already innately knew – we are all so wonderfully unique. Treatments that cater to our uniqueness are the next generation of medicine. Interestingly, this “next generation of medicine” won’t be medicine at all. Instead, we are harnessing the body’s and the gut microbiome’s natural ability to heal itself. The power of precision wellness starts by examining your cellular individuality and through the power of AI analysis, delivers one-of-a-kind actionable recommendations. Are you eating too much protein? – As we mentioned above, this is a common problem we see. Trendy diets like the Paleo and Ketogenic diet have led to a boost in protein intake that can cause some people health problems. The happens when you have too many Alistipes putredinis and Tannerella forsythia bacteria who ferment the excess protein. This is a serious situation, which can lead to conditions like leaky gut syndrome. RNA sequencing is going to give you the most precise understanding of how your gut microbiome operates. Ultimately, what works for you completely depends on the composition of your gut microbiome. Learn more about harnessing the power of your unique gut microbiome so you can optimize your health with Viome testing. Your Viome test examines the transciptome, meaning it sees everything down to a strain level – plus what your microbes are actually doing through pathway analysis. Through a combination of RNA sequencing and our revolutionary AI analysis, you’ll receive targeted diet and supplement recommendations, which you can put to work right away. Remember, your gut microbiome is unique and dynamic, which is why Viome isn’t a “one and done” analysis. You wouldn’t get a complete picture if we didn’t stick with you as you change your diet. Our revolutionary testing is a year-long journey that results in better health through optimized nutrition. It’s only $399 for the entire year. You’ll receive personalized and actionable recommendations, which you can easily see on your Viome app. In order to stay on top of what’s happening in the gut, it is recommended that you re-test once every three months, or after you make a significant dietary or lifestyle change. During your year of service, you have the ability to re-test for an additional $199 per test and may do so at any time. We couldn’t be more excited about the future of human health!